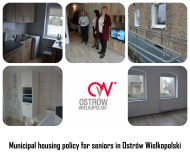 This program was created in response to the needs of a growing number of seniors and the lack of flats currently dedicated to people 60 + in Ostrów Wielkopolski. Common problems faced by seniors include stairs, no elevator, and a lack of help. This project aims to solve these issues.